Today my piece with the NIH's Kevin Hall was published in The Lancet. The piece, reproduced below, speaks to the lack of clinical utility of large swaths of the weight loss literature and suggests an alternative direction to consider with future studies. Over the past several decades, dozens of randomised controlled trials have compared various diets for the treatment of obesity. Ideally, such studies should have provided strong evidence for clear clinical recommendations and also put a stop to society’s endless parade of fad diets. Unfortunately, the evidence base remains contested and the “diet wars” continue unabated. One insight that can be gleaned from the existing weight loss literature is that even the most divergent of diets seem capable of affecting a degree of short-term success, with some diets perhaps leading to marginally greater losses than others over periods of several months.1 But since obesity is a chronic condition, it is the long term that matters. An effective diet for clinical weight management needs to be established over time scales of years to decades. Studies that have lasted 1 year or more typically do not show significant differences between prescribed diets, much less any clinically meaningful differences in maintenance of lost weight.1, 2 One example is in the Dietary Intervention Randomized Controlled Trial (DIRECT), which has been hailed as proof of the superiority of low-carbohydrate diets over low-fat diets.3,4 The DIRECT investigators used a 2-year workplace intervention and found that a low-carbohydrate diet prescription led to a significant 1·8 kg greater mean bodyweight loss than the prescription of a low-fat diet.3,4 These bodyweight differences between the diets are among the largest differences that have been observed over a 2-year period. But from the clinical perspective, such small bodyweight differences do not instil confidence for prescribing one diet over another to a patient with obesity. 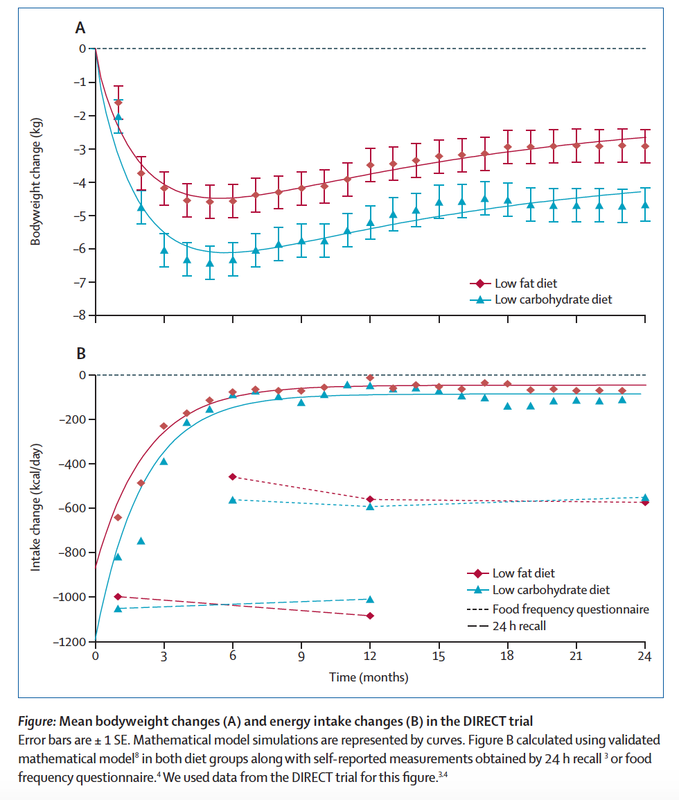 What is especially striking is the similarity of the long-term pattern of mean bodyweight change, irrespective of diet prescription.5 For example, figure 1A shows data from the DIRECT study in which both the low-fat and low-carbohydrate diets resulted in rapid early weight loss that plateaued after about 6 months at a likely disappointing level6 and was then followed by slow bodyweight regain. What can we learn from the physiology underlying such a bodyweight trajectory? Complex physiological feedback mechanisms regulate bodyweight and resist weight loss. Slowing of metabolism can be substantial and persistent7 and plays a part in halting weight loss and putting subsequent weight regain into motion. However, the typical bodyweight trajectory is primarily driven by patients experiencing an exponential decay of diet adherence due to an increase in appetite in proportion to the loss of bodyweight,8 along with difficulties in sustaining changes to dietary choices and behaviours that affect patients’ ability to enjoy, celebrate, and socialise with food. Figure 1B shows the energy intake changes underlying the DIRECT trial’s observed bodyweight trajectories, which we have calculated using a validated mathematical model of human energy metabolism and bodyweight dynamics.9 At the plateau point of maximum weight loss, energy intake is balanced by expenditure and has decreased from baseline by about 200 kcal per day. 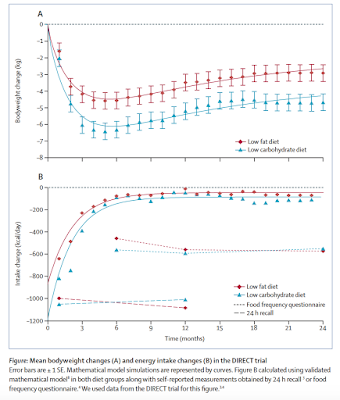 By contrast, mean energy intake at the bodyweight plateau has increased by about 700–1000 kcal per day from its early reduction at the start of the intervention. After 1 year, mean bodyweights, although still reduced by several kilograms, climb back up in response to the average energy intakes returning almost to baseline levels. Diet adherence is so challenging that it is poor even in short-term studies where all food is provided.10 When diets are prescribed, adherence is likely to diminish over the long-term despite self-reports to the contrary. Figure 1B illustrates that the common self-report methods for measuring food intake (24 h recall and food frequency questionnaire3,4) mistakenly indicate that the reduction in energy intake remained unchanged throughout the intervention. Such erroneous measurements have led to speculation that a reduction in energy expenditure, rather than loss of diet adherence, is the main driver of the bodyweight plateau. However, these self-reported measurements are known to be inaccurate for estimating energy intake11 and provide unreliable data on energy intake changes that are not quantitatively reconcilable with objectively measured weight regain and the known physiology of energy metabolism adaptations. The similarity of mean bodyweight trajectories between long-term diet interventions, whether targeting macronutrients, calories, or food patterns, is explained by the fact that no diet has yet been shown to be uniformly easier to stick with than another in the long run. If there existed a diet that led to substantially improved long-term adherence in most patients—because it better addressed appetite changes, provided a sustained metabolic advantage, or was simply easier for patients to maintain—such effects would result in substantial and sustained differences in mean bodyweight. This result has not been observed despite repeated efforts using widely different diets. Nevertheless, and hearteningly, anecdotal long-term diet success stories abound for most dietary approaches, and focusing on mean bodyweight trajectories masks the high individual weight loss variability within each diet group. The question is: why are some individuals more successful than others? When it comes to clinical weight management, success is predicated on long-term dietary adherence. Therefore, we need to increase our efforts to understand the individual differences between patients that have an effect on diet maintenance and prevent its erosion. Studies should determine how to target effective diets to individual patients,12 as well as improve our understanding of the real world considerations that impinge on patients’ abilities to sustain healthy dietary changes,13 such as those wrought by the food environment, socioeconomic factors, cooking skills, job requirements, medical comorbidities, caregiving responsibilities, and many more. After all, as with every chronic disease, successful obesity management requires lifelong treatment and there is a pressing need to help patients navigate day-to-day realities in the face of maintaining a permanent and intentional behaviour change. We also need to better understand how family, community, and society as a whole can help support and sustain healthy lifestyles. Fewer resources should be invested in studying whether or not a low-carbohydrate diet is marginally better than a low-fat diet, or whether intermittent fasting provides marginally better short-term outcomes than a so-called Paleo diet. Crowning a diet king because it delivers a clinically meaningless difference in bodyweight fuels diet hype, not diet help. It’s high time we started helping. YF has received honoraria and travel expenses from Boston Children’s Hospital, Canadian Obesity Network, Centre for Effect Practice, Academy of Medicine Ottawa, Physical and Health Education Canada, North York General Hospital, , IDEA Health and Fitness Association, and the Royal Society of Medicine, London, for speaking engagements and for his role as clinical lead in the development of a Canadian Ministry of Health funded tool for primary care providers working with families of children with obesity; and has received fees for developing and delivering educational seminars to medical students and residents from the University of Ottawa. YF writes a blog, Weighty Matters, that is non-monetised with no advertisements or requests for donations. YF is the co-author of Best Weight: A Practical Guide to Office-Based Obesity Management all royalties from the book go to the Canadian Obesity Network and he is the author of The Diet Fix (Random House) and receives royalties from this book. KDH reports a patent pending on a method of personalised dynamic feedback control of bodyweight (US Patent Application No. 13/754,058; assigned to the National Institutes of Health) and has received funding from the Nutrition Science Initiative to investigate the effects of ketogenic diets on human energy expenditure. 1 Johnston BC, Kanters S, Bandayrel K, et al. Comparison of weight loss among named diet programs in overweight and obese adults: a meta analysis. JAMA 2014; 312: 923–33. 3 Greenberg I, Stampfer MJ, Schwarzfuchs D, Shai I. Adherence and success in long-term weight loss diets: the dietary intervention randomized controlled trial (DIRECT). J Am Coll Nutr 2009; 28: 159–68. 4 Shai I, Schwarzfuchs D, Henkin Y, et al. Weight loss with a low-carbohydrate, Mediterranean, or low-fat diet. N Engl J Med 2008; 359: 229–41. 5 Franz MJ, VanWormer JJ, Crain AL, et al. Weight-loss outcomes: a systematic review and meta-analysis of weight-loss clinical trials with a minimum 1-year follow-up. J Am Diet Assoc 2007; 107: 1755–67. 6 Foster GD, Wadden TA, Vogt RA, Brewer G. What is a reasonable weight loss? Patients’ expectations and evaluations of obesity treatment outcomes. J Consult Clin Psychol 1997; 65: 79–85. 7 Fothergill E, Guo J, Howard L, et al. Persistent metabolic adaptation 6 years after “The Biggest Loser” competition. Obesity (Silver Spring) 2016; published online May 2. DOI:10.1002/oby.21538. 8 Polidori D, Sanghvi A, Seeley RJ, Hall KD. How strongly does appetite counter weight loss? Quantification of the feedback control of human energy intake. Obesity (Silver Spring) 2016 (in press). 9 Sanghvi A, Redman LA, Martin CK, Ravussin E, Hall KD. Validation of an inexpensive and accurate mathematical method to measure long-term changes in free-living energy intake. Am J Clin Nutr 2015; 102: 353–58. 10 Das SK, Gilhooly CH, Golden JK, et al. Long-term effects of 2 energy-restricted diets differing in glycemic load on dietary adherence, body composition, and metabolism in CALERIE: a 1-y randomized controlled trial. Am J Clin Nutr 2007; 85: 1023–30. 11 Dhurandhar NV, Schoeller DA, Brown AW, et al. Energy balance measurement: when something is not better than nothing. Int J Obes (Lond) 2015; 39: 1109–13. 12 Bray MS, Loos RJ, McCaffery JM, et al. NIH working group report-using genomic information to guide weight management: from universal to precision treatment. Obesity (Silver Spring) 2016; 24: 14–22.